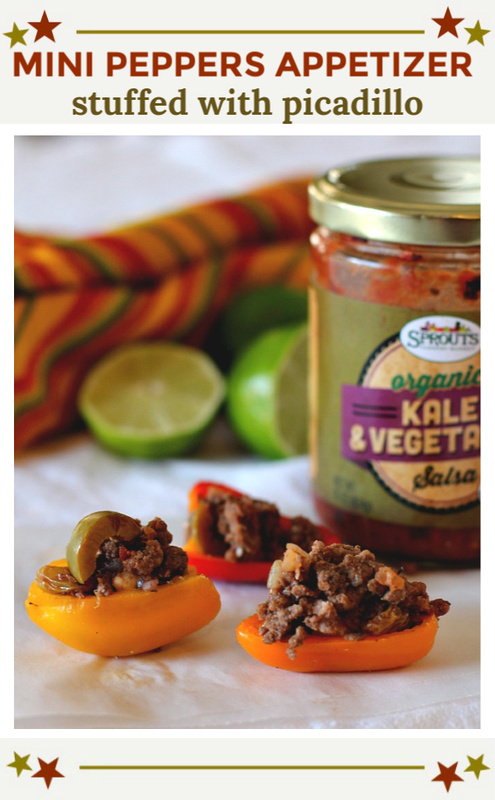 Mini Bell Peppers stuffed with Picadillo. 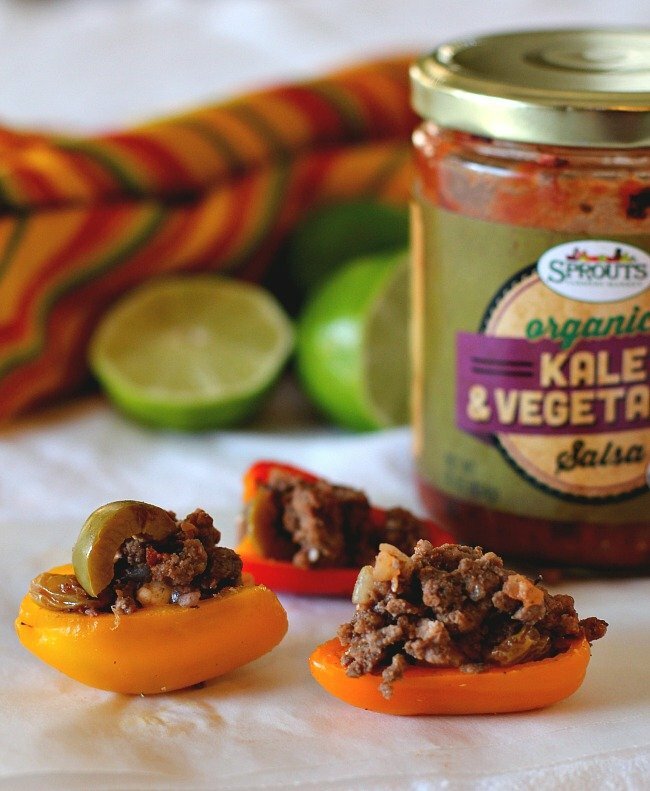 A soft fragrant combination of ground beef and salsa, with raisins for sweetness and olives for salt. Scented with red wine and cumin this is a delicious and unique appetizer recipe. I have been compensated and provided with product by Sprouts Market for this article. My opinions are my own. In just a few days, the 2016 Olympics will kick off in Rio de Janeiro, with thousands of athletes from 206 countries competing in the games. Being sports minded people around our house, it’s a tradition that we’re always tuned in to watch. And, with things seemingly going awry, it’s going to be interesting to tune in this year. With Zika, the Olympic Village housing situation, track and field doping, rumors of corruption within the Olympic Committee. I have to admit I’m somewhat biting my nails over whether the flaming Olympic cauldron will reign over the tradition of athletic skill and competitive spirit or over all the controversy. With that said, any major televised sporting event calls for food and preferably finger food that’s adaptable for snacking in front of the television. Thanks to Sprouts Farmers Market for sponsoring this post and asking me to participate in an Olympic Watching Party. Sprouts had me choose a country to theme my recipe around and being the student of Mexican and Southwestern fare, no surprise that I chose Mexico. Hence, these mini bell peppers appetizer recipe was born. And it wasn’t a coincidence that I modeled my recipe around Sprouts Salsa. 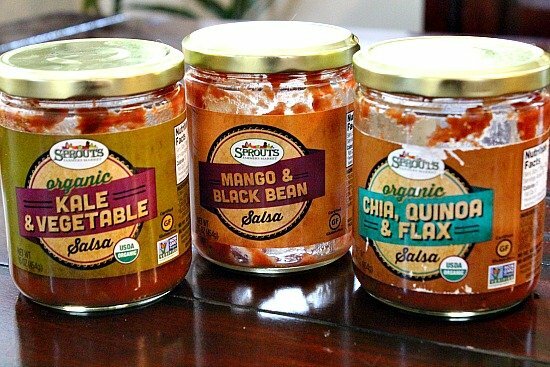 I recently discovered Sprouts unique salsa mixes and have personally awarded them the gold medal of jarred salsas. There is actually flavor in these jars, not just an abundance of tomato and vinegar. They’re delicious, and I won’t purchase any other. 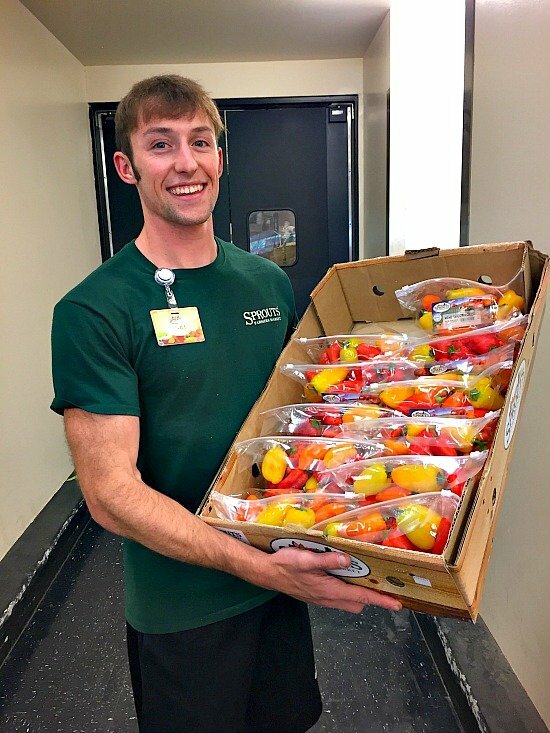 With my appetizer plan in mind, I ventured over to my Sprouts on County Line Road to get a package of those sweet bite-sized mini bell peppers, and no surprise, they had a beautiful selection. For me, one of the best things about Sprouts Farmers Market is its produce department. You don’t name your company “Sprouts” if you’re not serious about produce. At the heart of healthy eating are fruits and vegetables, and you’ll find mountains of farm-fresh produce, seasonal and organic, at truly amazing prices. And, always, and I mean always, someone readily available to assist you in your search for just the right item. So, back to my appetizer idea, Picadillo Stuffed Mini Bell Peppers. Picadillo is one of the great dishes of Cuba. Versions of it reach across the Caribbean and into Latin America. I’ve read that every Mexican kitchen has its own take on Picadillo, just as we in America have on a pot of Chili. Picadillo is a soft, fragrant combination of ground beef and tomatoes, with raisins added for sweetness and olives for salt. My version combines onions, garlic and Sprouts Kale and Vegetable Salsa, and scents it with red wine and cumin. For the olives you may experiment with fancy and plain, but I suggest pimento-stuffed green olives. A scattering of capers adds the perfect zing and zest for this wonderfully flavorful beef dish. Make sure everything is chopped fine and the ground beef is broken up well while cooking. 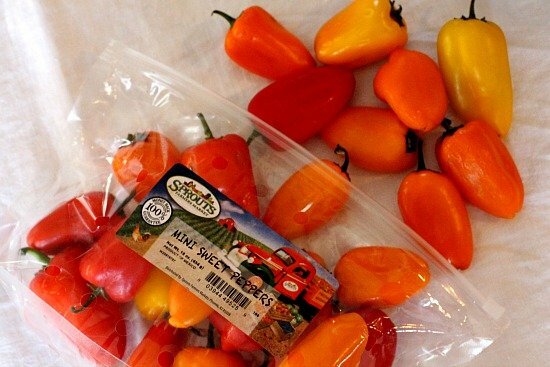 You want every little piece of flavor to fit nicely into those wonderfully colorful and sweet mini bell peppers. 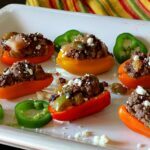 I hope you try these picadillo stuffed mini bell peppers. And if you do please come back and give the recipe a star rating. And leave a comment about your experience with the recipe. And if you have an appetizer recipe for mini bell peppers, please let me know, I’d love to give it a try. A soft fragrant combination of ground beef and salsa, with raisins for sweetness and olives for salt. With red wine and cumin and Sprouts Kale and Vegetable Salsa, this is a great stuffing for Sprouts Mini Sweet Peppers. Preheat oven to 350 degrees. Prepare the bell peppers. Slice them in half and clean out the seeds. Place the peppers on a sheet pan and roast for 15 minutes. Remove from oven and let cool. Heat half of the bacon fat in a heavy skillet. Add the beef and onions and cook over medium high heat, stirring constantly until evenly browned. Reduce the heat and add the wine and lime juice. Cook for 5 minutes. Stir in salsa, olives, capers and raisins. Cover and simmer for 20 minutes. Heat the remaining fat in another skillet. Fry the potatoes, garlic and cumin, turning occasionally until evenly browned. Lower the heat and cook for 10 - 12 minutes or until potatoes are tender. Add the potatoes to the meat mixture and cook gently for 5 minutes. Season to taste. With a small spoon, fill the bell peppers with the meat and potato mixture. To serve, sprinkle with Cotija cheese and fine chopped cilantro. 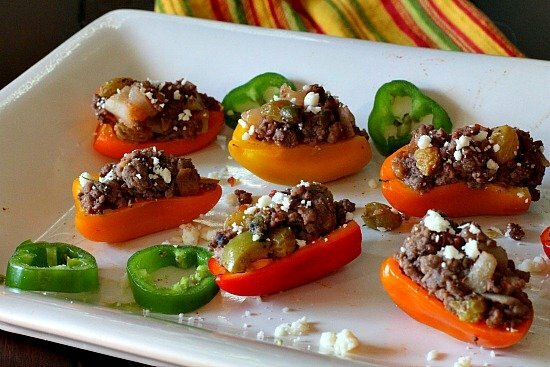 Picadillo Stuffed Mini Bell Peppers…They’re what’s for Watching the Olympics. We keep those mini sweet peppers in the fridge at all times for eating out of hand and tossing alongside some other veggie on the grill. Now, I have a new plan for these babies. Thank you! Love the mini bells and this recipe sounds delicious! Love the salsas and will check out their flavor combos! Looks delicious and sprouts sounds like the place to go. I have never been so underwhelmed by the Olympics than this year. We usually record everything and watch it all evening long. Not this year. But, I am overwhelmed by this mini-appetizers. Kudos, Lea Ann. Picadillo really is a great dish, isn’t it? And you’ve kicked the whole thing up a notch with this recipe. Love the mini peppers! And yes, the Olympics are going to be interesting — hope they get everything resolved in time. These stuffed peppers look like a great dish for the Olympics, love that you created so much flavor. I think we are in for a few surprises with all that is going on. Thanks Lea Ann! I always have those mini peppers on hand but have never stuffed them before! What a great idea for a party. Everyone loves a stuffed pepper.. these look great!